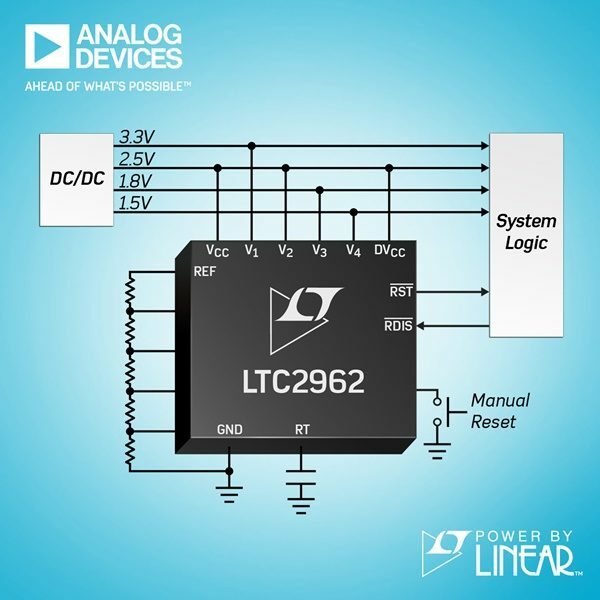 Analog Devices announces the Power by Linear™ LTC2962-LTC2964 family of exceptionally accurate 4-channel voltage supervisors for increased system voltage margin and enhanced reliability. ASIC, FPGA, DSP, MCU and MPU architectures that operate from supplies as low as 1V cannot utilize traditional 1%-2% accurate voltage supervisors without shedding valuable system voltage margin and shrinking the remaining load operating voltage range. The LTC2962 family possesses a best-in-class ±0.5% reset threshold accuracy, which relaxes power supply demands, increases system tolerance to transients, and enabling a lower nominal supply to dramatically reduce power consumption. The LTC2962 family fulfills many network, telecom and automotive requirements with its high accuracy, flexible 1V to 5V (or adjustable) reset thresholds, and wide operating temperature range.